M1A1 tank on base U.S.M.C. 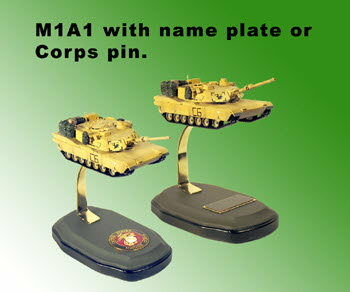 [DSK-308] - $48.50 : Metalcraft by Blair - military gifts and memoribilia. Home :: Desk Sets of all types :: U.S.M.C. :: M1A1 tank on base U.S.M.C. You can get this with eather the engraved name plate or with the Marine Corps pin ( both are free with the purchase). the model is about 6" long .